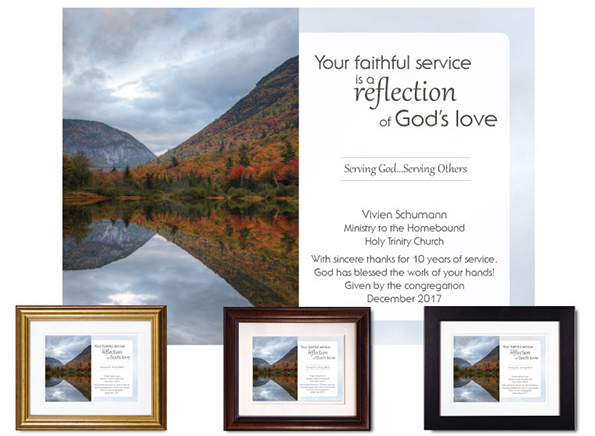 We’re busy this time of year creating plaques for congregations who annually recognize the dedicated service of volunteers during the Christmas season. Does your church do the same? If you’re looking for a way to convey thanks in a tangible way, we have dozens of personalized service appreciation plaques from which to choose! Each one is custom created and hand-finished especially for the recipient. We use only premium inks and papers, as well as museum-quality matboard. You can be sure these will look just as good years from now as they do the day you present them!